On your way through the King’s Fall Raid of Destiny The Taken King you can again find hidden chests with loot, partly well hidden in chambers. We show you how to get to the boxes and what they have in store for you. - Two players face the left and right to the pressure plates. Thus, the door to the platform with the chest will open. - The four players should go by boat to the other side. But jump before crossing the huge gate, to the ledge on the left. - It is important that the timing must be exactly right here when the hunters jump, as they can not jump as far as the Titans and Warlocks. - Now you go through the door to the cabinet. - The team now in the room. However, the chest is now logically closed. - Therefore, the other four players loot the crate and go down to the hidden door for the other two players on the pressure plates on the other side to open. In this way, they get the loot in time before it disappears. The next Chest is in Golgoroths cellar. Here you will some symbols that you must activate them in the correct order with your team. 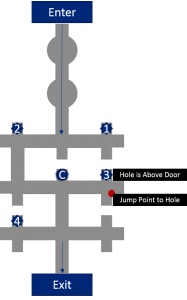 The symbol number 3 (see map below) is behind a door, which you can enter through a hole. Now jump in the correct order on the leaves. 3-4-2-1 and 3-2-1-4. - Move along the abyss and just before you come to the pressure plate look to the right, where you can see the passage to the chamber with the chest in the distance. - The task now is to jump on the overgrown ledge of the pillar in the middle. - From here you have now with your jump arts pave you a way through invisible platform for passage.